Walsine Pierce: A HERO SPEAKS OUT: Read this long blog, please! Among the news today are pictures of the historic release of victims of the Nazi death camps by American troops 65 years ago today. Interviews were conducted with several of the soldiers who effected the releases. 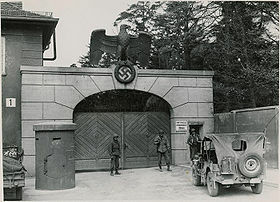 The picture on the right is Dachau guarded by American troops following the release--I have been to Dachau. 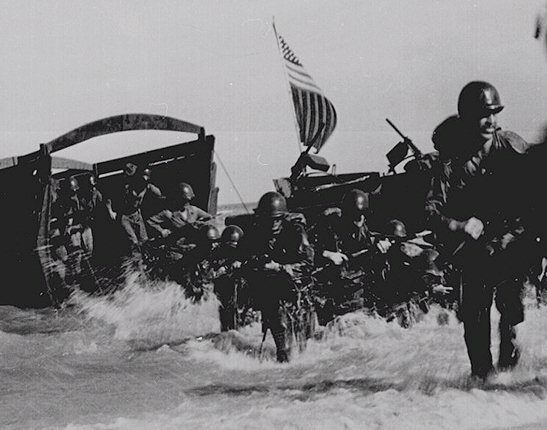 Sadly, the number of WWII US Military are growing smaller and smaller. John Strader, my wife's grandfather, a wounded army vet, served with Patton in Africa and in Italy. Her father, John Myers, was injured for life when his gun turret exploded in action against a Nazi sub. My first cousin, Ira Shamblin lost his life in Africa. Jim Byus, my sister-in-law's brother, died in France. My brother, Henry, survived in the US Navy Armed Guard against many attacks against the tankers on which he served. ALL THESE VETS HAVE PASSED AWAY LONG AGO. One surviving hero is a dear friend of mine. 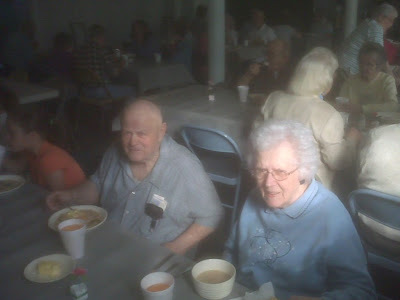 His name is Delbert Rauschenberg, shown above at a church bean supper with his lovely wife Connie. Delbert was a landing craft coxswain's mate, a Bos'n Mate Third Class, BM3, transporting troops to the beach invasion.. Landing craft had a crew of three. In addition to the cox'n, who steered the boat, there was a deck hand and a motor machinist, who were called deck apes and snipes. 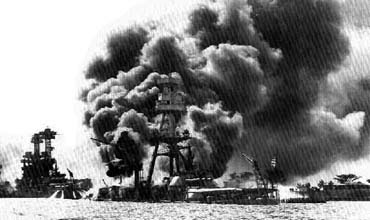 Only the cox'n was directly exposed to enemy fire although all were exposed to bombs and shells that could explode the entire craft. To survive one beach invasion was a night mare. 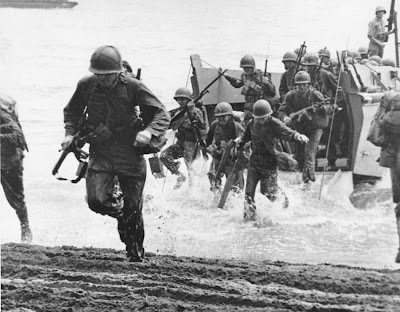 People dying, the nearby boats being blown out of the water, troops being hit when discharged on the beach, bombs and shells exploding all around you. Truly hell on earth! DELBERT RAUSCHENBERG SURVIVED NOT ONE BUT SIX BEACH INVASIONS ACROSS THE PACIFIC. I have been to five of those six invasion sites immediately after the war, including Guam, the first American soil conquered by the Japanese. Delbert shared with me his experience on Guam. 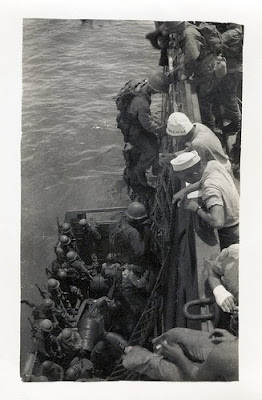 He had been hauling troops for three days without relief. He was dead on his feet from fatigue. His crew could at least close their eyes or relax briefly. Delbert had to alertly stand, fully exposed, and maneuver the landing craft through the congested and troubled waters. After three days Delbert told his motor mac that he was unable to make another run. He was ready to collapse. 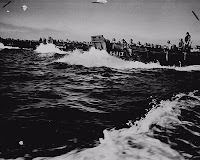 Delbert told him to steer the landing craft along side of one of the fleet ships and tie up, then Delbert did collapse. 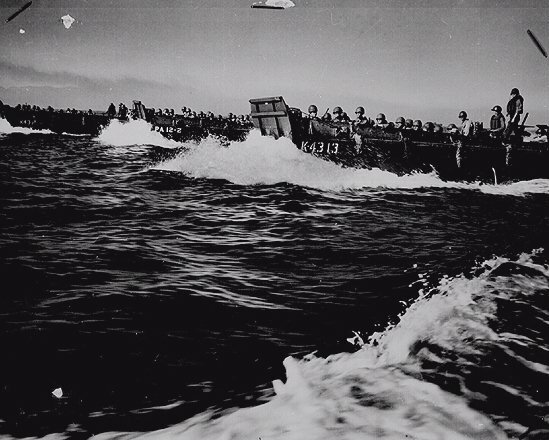 The well meaning motor mac made the landing craft fast to the shore side of a navy cruiser, thinking it would shelter the little craft from the sea swells. (Snipes are not known for their brains, too much diesel in their coffee). His crew then collapsed with Delbert. Next morning the landing craft crew were rudely awakened when the cruiser, which had trained it's massive guns shoreward right over the little craft, opened fire. The concussion from the muzzle blasts, directly overhead, made Delbert totally deaf. He regained his hearing in three days but today, in his mid 80's, he suffers from loss of hearing. WE HAVE NO GREATER HERO THAN DELBERT RAUSCHENBERG AND HIS FELLOW PATRIOTS! They are all around us although we never see them. They are jusr ordinary Americans. One such hero, Harold Estes, Master Chief Bos'n Mate, retired, of a WWII battleship, has elected to speak out on the trend the Obama presidency is taking us. Below is the article mailed to me from my high school class mate, Maude (Blankinship) Norris, pictured on the right. (Yes, that was a "before" picture, before 62 years of riotous living, knowing Maude. UMMM!). This venerable and much honored WWII vet, shown above, is well known in Hawaii for his seventy-plus years of service to patriotic organisations and causes all over the country. A humble man without a political bone in his body, he has never spoken out before about a government official, until now. He dictated this letter to a friend, signed it and mailed it to the president. I enlisted in the U.S. Navy in 1934 and served proudly before, during and after WWII retiring as a Master Chief Bos'n Mate. Now I live in a "rest home" located on the western end of Pearl Harbor, allowing me to keep alive the memories of 23 years of service to my country. "America is arrogant" - Your wife even announced to the world, "America is mean-spirited." (Please tell her to try preaching that nonsense to 23 generations of our war dead buried all over the globe who died for no other reason than to free a whole lot of strangers from tyranny and hopelessness.) I'd say shame on the both of you, but I don't think you like America nor do I see an ounce of gratefulness in anything you do, for the obvious gifts this country has given you. To be without shame or gratefulness is a dangerous thing for a man sitting in the White House. After 9/11 you said "America hasn't lived up to her ideals." Which ones did you mean? Was it the notion of personal liberty that 11,000 farmers and shopkeepers died to win independence from the British? Or maybe the ideal that no man should be a slave to another man, that 470,000 fathers, husbands and brothers and a lot of fellows I knew personally died for in WWII, because we felt strongly about not letting any nation push us around, because we stand for freedom. One more thing. I realize you never served in the military and never had to defend your country with you life, but you're the Commander-in-Chief now, son. Do your job. When your battle-hardened field General ask you for 40,000 more troops to complete the mission, give them to him. But if you're not in this fight to win, then get out. The life of one American soldier is not worth the best political strategy you're thinking of. You could be our greatest president because you face the greatest challenge ever presented to any president. You're not going to restore American greatness by bringing back our bloated economy. That's not our greatest threat. Losing the heart and soul of who we are as Americans is our big fight now. And I sure as hell don't want to think my president is the enemy in this final battle. (http://www.snopes/. com politic/soapbox/haroldestes.asp confirms this as true). CAN YOU IMAGINE THE CHAGRIN THAT THIS PICTURE OF THE PRESIDENT OF OUR SOVEREIGN NATION BOWING TO A JAPANESE LEADER CAUSES OUR VETS? He represents all of us in his action but neither Chief Estes nor Cox'n Rauschenberg bows to our former enemy. 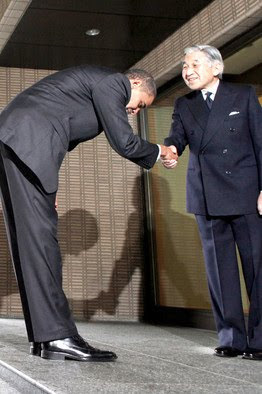 I've been to Japan a number of times but did no bowing. 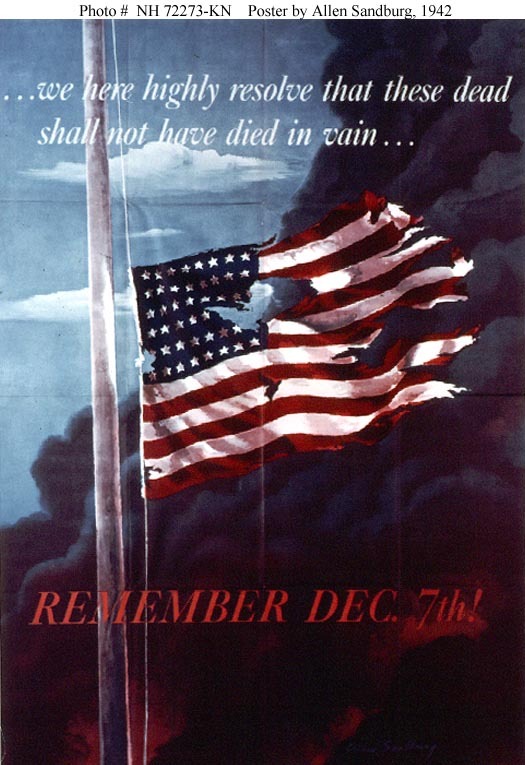 WE REMEMBER PEARL HARBOR! Let us follow the leadership of our true heroes and correct this political problem. Vote in 2010. Vote in 2012. SHARE THIS BLOG WITH YOUR FAMILY, FRIENDS AND NEIGHBORS. God bless us one and all and God bless the USA.